I thought Velcro — or more generically, hook-and-loop fasteners — only came in adhesive-backed styles, but then I ran into these Velcro rolls at work, where we use ’em for cable management. The hooks are on one side of the roll and the loops are on the other. I may be the last Toolmonger to come across these little round gems, but I thought I’d pass ’em along just in case. We strap cables together with this stuff, or attach them to hard points so they look neat and stay in place. The rolls would also work great for organizing sporting goods, toys and games, power cables, or just anything you need to keep together. You just cut off what you need and wrap it up — if you cut it too short, just add another piece. The best part is they’re reusable, unlike zip ties. I’ve found these rolls in widths from 1/4″ to 1″ and in all colors, made by major and minor manufacturers. The smaller sizes start at about $19 for 25 yards. I really like the Velcro cable ties that you buy at Home depot — 50 for about $5. The nice thing about these is that they have a slot in the head so they stay put when you loosen them. But I can definitely see the utility in having a big roll that you can just cut off the exact size you need. I have used 1″ to hold the soft top down to the body on my Jeep for years. I bought one roll of hooks and one roll of loops about 25 years ago. If it gets damaged just put on fresh. 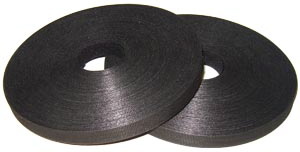 Feiner has all sorts of velcro products up to 4″ in width. Totally Hot for almost anything around the house. Like Tim I bought three rolls in different colors for my home network/RF cabling and a million different power cords, etc. It lasts forever and is always handy.